Sky Sports pundit Gary Neville says that Liverpool has a great opportunity to win the Premier League this season and praises their overall squad depth. Jurgen Klopp’s men made a stunning start to the new season last weekend, beating West Ham 4-0 at Anfield thanks to two goals from Sadio Mane along with Mohamed Salah and Daniel Sturridge strikes either side of half-time. The Red’s were in scintillating form and displayed the full potential of their attacking talent whilst remaining solid at the back throughout the game. Liverpool managed to finish 4th in the league last season and reach the European Cup final, progress which has been built upon over the summer in the transfer window with the arrivals of Fabinho, Naby Keita, Alisson and Xherdan Shaqiri. Optimism is high amongst supporters and many experts believe that Klopp could guide his team towards their first ever Premier League crown come May, with even former Manchester United defender Gary Neville stating he is a believer ahead of Liverpool’s clash with Crystal Palace tonight. 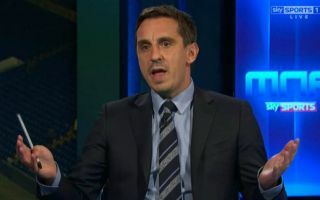 Neville told Sky Sports: “It’s the shortest odds that Liverpool have been for 10 years. “It’s probably the first time at the start of the season that I’ve thought they have a genuine chance of winning the league. “What Liverpool are doing here – with 22 goals conceded in 30 games, 74 scored in 30 games – if you project that over a 38-game season and they can achieve these numbers, they would win the championship in terms of those averages and goals, in many of the seasons. “I do think they’ve got the best chance that they’ve had in a long, long time. Their biggest rivals for the title this year will no doubt be reigning champions Manchester City, who have started their campaign with back to back wins, but they may also face competition from Spurs and Chelsea, both of whom have also managed to pick up maximum points from their first two games.